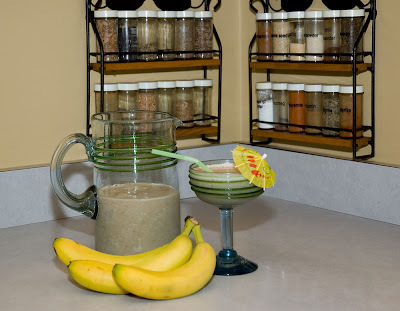 This week’s recipe is quite delicious and chock full of potassium; that would be from the bananas. There are numerous versions of this drink, but this is the one I prefer. I think the coffee liqueur really makes this one outstanding. 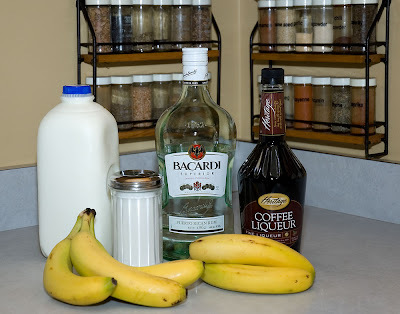 We’ve got white rum, coffee liqueur, bananas, milk and sugar. 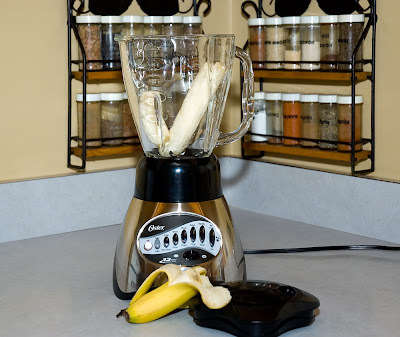 Place one and a half to two bananas in a blender. Add ½ cup of white rum. 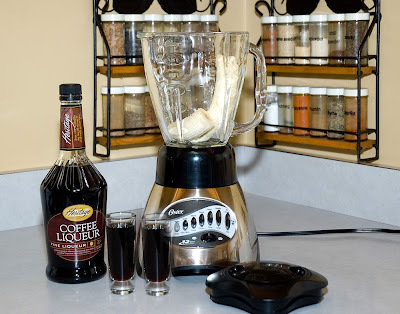 Then add ½ cup coffee liqueur. Next add ½ cup milk. The last ingredient is 2 tablespoons of sugar. 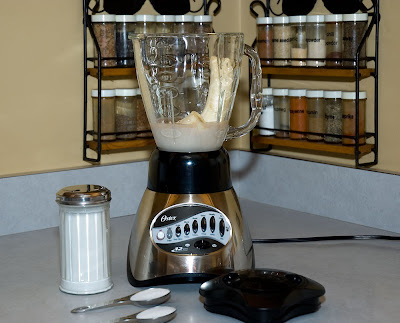 Now add plenty of ice to the blender…and blend. Pour into glass, sit back and enjoy. I am drooling. This sounds heavenly. I am going to try it tomorrow. I really enjoy your Drinks segments. Have a great weekend. This looks delicious. I am on a certain medicine this week so I can't drink (tear!) BUT I definitely want to make this sometime NEXT week! Have a great weekend! God, you are good! Keep this up and I'll start pathetically asking for an invitation to your place. 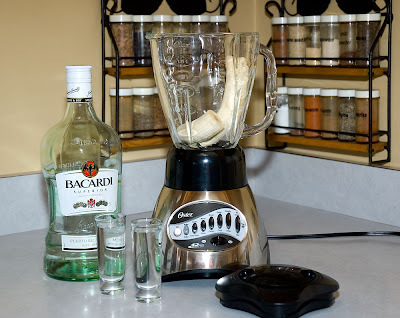 Two tips on making the perfect Daquiri. 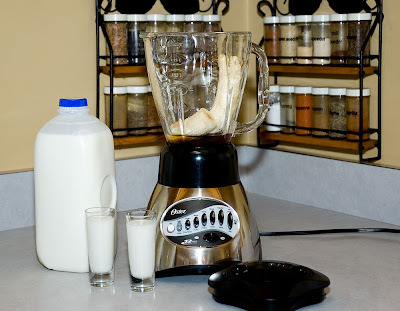 When adding sugar it is always best to blend the ingredients first before adding ice. This allows the sugar to dissolve more easily. 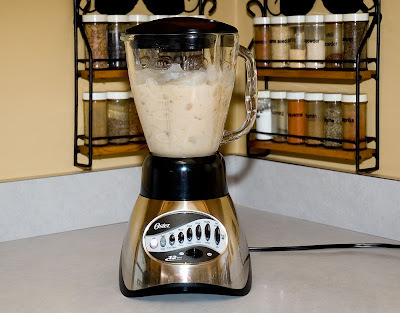 The second tip is that after adding ice and blending for a bit, take the lid off and use a spoon to help the mixing. This will make sure it is a nice smooth drink instead of having some bits of ice. Just watch out for the blades with the spoon. The recipe came from a trip to Jamaica. The only difference is that I think they used goat's milk instead of that from a cow. You can only drink so much Red Stripe. LOL! Startin' out early, aren't we? It's not even time for lunch yet! Well ya lost me on the coffee liqeur, can't stand coffee. Happy Friday tho! Mmmmm....I'm sooo gonna try this out!! Holy Awesome-Ness. I am printing this out and making this TONIGHT. Thanks for the extra tip on when to blend the ice and add the sugar! Cant wait to drink this bad boy! Yummmm...I read Selma's blog all the time and was intrigued by your blog name, now I 'get it'. Sorry that you work in hell but the drinks must help a bit right LOL...Truly, they look and sound delish. I'm going to start drinking at work because of this. Oh that sounds positively decadent! Mmmm! Thanks so much for dropping by my blog via Coal Miner's Granddaughter. Heather was one of my first readers, and she's high quality people. Do drop by again! I'll add your blog to my list, too.